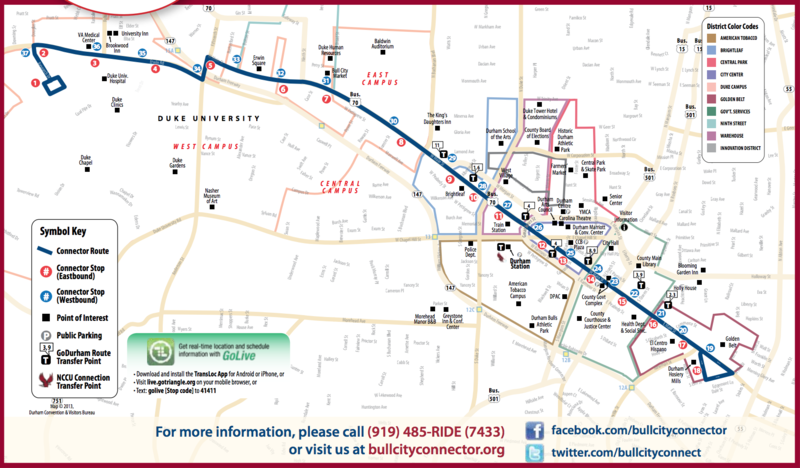 The Bull City Connector is a fare-free route that runs every 17 minutes! This funky and eclectic dining and shopping district near Duke's East Campus around historic Erwin Mill features nationally recognized restaurants and independent stores selling books, clothes, music and more. The district cover Erwin Square, Broad Street and Ninth Street North. This district's namesake is a historic textile mill campus reborn as a creative arts hub with unique dining, shopping, art studios and galleries, outdoor areas, event space, condos and office. The Warehouse District is dominated by the West Village, which now includes loft-style apartments, retail space, offices and the Durham Train Station.